A twenty-first century renaissance is emerging in architecture. After a century of building designs characterized by high energy demand, low quality lighting and poor thermal comfort, the fundamental questions must be asked again: is there a better path to designing the most energy efficient, comfortable, functional and beautiful buildings for a sustainable future? While seeking solutions for the future, are there lessons to be learned from the best buildings of the past? 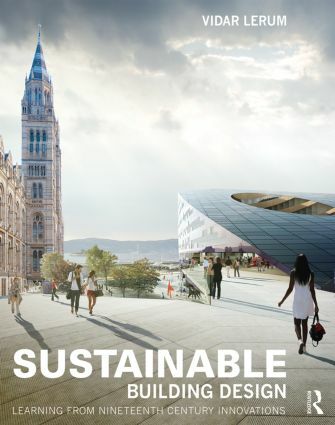 Sustainable Building Design explores outstanding buildings and building designs of the twenty-first century, with an emphasis on the artistry of masters of architecture who came before. By dissecting and analyzing great public buildings of the nineteenth and twenty-first centuries, materials, techniques, and methods are discovered. This book presents the reader with clues and suggestions that will reveal the secrets of these buildings and by doing so provides the reader with a thorough understanding of how these architectural masterpieces work. Using photographs, drawings, sections, plans and diagrams which are painstakingly redrawn for consistency and clarity based on a wide range of documentation, Vidar Lerum compares works of architecture from the nineteenth and twenty-first centuries. The reader is presented with a careful analysis of each building, providing a compelling sourcebook of ideas for students and professional architects alike. Vidar Lerum is an Associate Professor at the Illinois School of Architecture at the University of Illinois, Urbana-Champaign, USA. He teaches design studios and design seminars at the undergraduate and graduate levels. His teaching experience includes design studios exploring the path to net zero energy building design, design seminars addressing minimalism in the age of conspicuous consumption, and environmental control systems courses. Lerum's research focuses on energy performance, human comfort and user satisfaction in buildings. He is a licensed architect in Norway and a member of the Norwegian Society of Architects (NAL). He is also a Co-opted Committee Member of the CIBSE Heritage Group and an International Associate member of the American Institute of Architects (AIA).